As of the time of this writing, the social network created by Mark Zuckerberg in 2004 in his Harvard dorm room is worth more than four hundred billion dollars. If Facebook were a country that would be the most populous on earth! Facebook’s business model is quite simple and based on advertising. Yet the company has been able to unlock so much business value from its operations that have become one of the most profitable tech giants, competing with Google, Netflix, Amazon, and Apple. FAANG is an acronym that comprises the hottest tech companies’ stocks. Those are Facebook, Amazon, Apple, Netflix and Alphabet’s Google. The term was coined by Jim Cramer, former hedge fund manager and host of CNBC’s Mad Money and founder of the publication TheStreet. *The term “Facebook” is used as interchangeable with “Facebook products” which is the set of apps Facebook Inc. owns (Facebook, Messenger, WhatsApp, and Instagram). Facebook enables people to connect, share, discover, and communicate with each other on mobile devices and personal computers. There are a number of different ways to engage with people on Facebook, the most important of which is News Feed which displays an algorithmically ranked series of stories and advertisements individualized for each person. As highlighted here the News Feed is the crucial component of Facebook. That is where the company can engage its users. That is also the place where the company manages to monetize its users. Instagram is a community for sharing visual stories through photos, videos, and direct messages. Instagram is also a place for people to stay connected with the interests and communities that they care about. Messenger is a messaging application that makes it easy for people to connect with other people, groups and businesses across a variety of platforms and devices. WhatsApp is a fast, simple, and reliable messaging application that is used by people around the world to connect securely and privately. Oculus virtual reality technology and content platform power products that allow people to enter a completely immersive and interactive environment to train, learn, play games, consume content, and connect with others. As we’re going to see the News Feed is the real cash cow. How much money does Facebook make? In 2018 Facebook made over $55.8 billion, most of it from advertising. Facebook also made a net income of over $22 billion. This means as of 2018, Facebook is extremely profitable. In 2018 revenues went up 37% year-over-year. Indeed, ad revenue was $55.01 billion, up 38% year-over-year. What does it mean? Shortly, not only Facebook has been able to accelerate its growth. However, it has also managed to reduce the growth pace of its expenses. That had a positive impact on the net income. Our cost of revenue consists primarily of expenses associated with the delivery and distribution of our products. These include expenses related to the operation of our data centers, such as facility and server equipment depreciation, salaries, benefits, and share-based compensation for employees on our operations teams, and energy and bandwidth costs. Cost of revenue also includes costs associated with partner arrangements, including content acquisition costs, credit card and other transaction fees related to processing customer transactions, cost of virtual reality platform device inventory sold, and amortization of intangible assets. When a company manages to become efficient in its spending while increasing its revenues that is a good sign for the financial health of the organization. In addition, Facebook has been pretty good in 2018, at increasing the monetization of users in the US & Canada, which made up a good chunk of its revenues. ARPU or average revenue per user is a critical metric to measure Facebook success as it makes money via advertising. I wouldn’t be surprised to see the other sources of income, other than advertising, grow in the next years. That is good to diversify the revenue stream. However, as of now, the company growth is tied to its ability to engage its daily active users. According to Facebook as of December 2017, there were 1.4 billion daily active users. Also, not all users are born equal. Some users (for instance, North America and Europe) are worth more on Facebook because those areas are monetized differently. Also, there is one key metric that tells us if the value of Facebook will keep growing in the long-run: ARPU. It’s all about ARPU: How much are you worth to Facebook? ARPU stands for average revenue per user. In short, how much money a company can get on average from each user. In Facebook case, we can take into account the monthly active users. For a company like Facebook, for which over 98% of its revenues come from advertising the amount of time people spend on the so-called news feed is crucial to increase the profitability metrics of the company. That isn’t only because Facebook is an advertising company, but also the way its business model was built. If you think about Google, what makes the company able to monetize its users is not necessarily how much time they spend on the search results pages. Instead, that is based on how fast users can find what they need. Once they click through that is how Google makes money. Of course, things are changing fast both on Google and on Facebook. Yet as of now the more time you spend on Facebook and the more you’re active on it, the more you allow it to make money. What else? Not all users are born equal. In fact, according to the geography and the ad market of each country, the monetization strategy changes. Facebook was founded in 2004 by Mark Zuckerberg in his dorm room at Harvard. Since then the company has never stopped growing. If it were a country, Facebook would probably be the most crowded on earth. However, the ability of the company to increase its value over time is based on how much money on average can make for each user. Over 98% of Facebook’s revenues come from advertising. Therefore, unless things will change; the news feed is still the primary driver for monetizing Facebook’s content. A simple change in its algorithm can influence the mood for billions of people. Also, it can affect the value of the company for billions of dollars. Thanks for sharing Irina, you surely made a good point. So far Facebook has been successful with its advertising network as it was able to provide a higher ROI compared to other advertising networks. However, as influencers can attract large audiences, it starts to make sense to have a deal directly with them and correct that in some cases it might have a higher ROI. Thus, the paradox is that Facebook might be cannibalizing its advertising revenues by making those influencers grow. 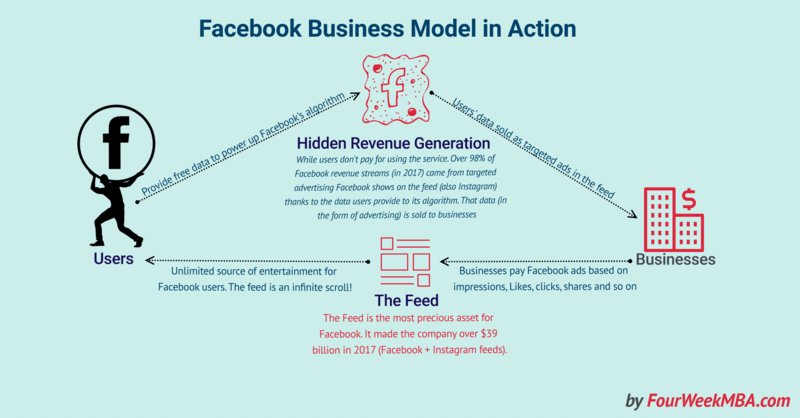 Therefore, we might assume that Facebook will experiment with new business models or it will limit the influence of those people that otherwise will erode Facebook revenues.